There never seem to be as many fun picture books about cats as about dogs (or maybe that's just my bias?) so I was particularly delighted with this charming new picture book based loosely on actual historical events. 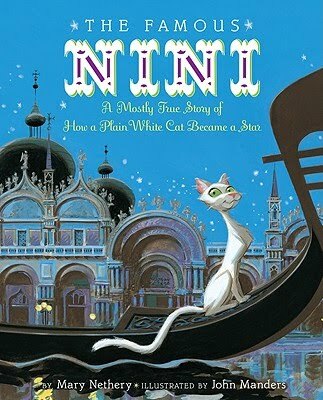 Set in Venice in the 1890's, the book tells the story of a struggling cafe owner, Nonna Framboni, who takes in a stray white cat and names him Nini. There doesn't seem to be anything special about Nini, until renowned composer Verdi wanders into the cafe to work on his latest opera. Unable to come up with just the right note until Nini meows, Verdi is thrilled and begins to frequent the cafe. The enterprising owner puts up a sign, The Great Verdi Takes His Coffee Here, and soon customers begin to flock to the cafe to see the famous composer as well as the now-famous cat. A progression of illustrious visitors come to visit Nini, including the king and queen of Italy, who declare National Nini Day, and even the Pope himself. But when the Emperor of Ethiopia brings his grief-stricken daughter to see the famous Nini, seeking a miracle, Nonna wonders if Nini will be able to deliver. What a lovely story this is about the healing power of animals and the joy they bring to humans. Author Mary Nethery is really a master at this genre; she is also the author of Two Bobbies: A True Story of Hurricane Katrina, Friendship and Survival and Nubs: The True Story of a Mutt, a Marine, and a Miracle, two other animal stories that will warm your heart. Illustrator John Manders, who has illustrated many children's titles including Henry and the Buccaneer Bunnies by Carolyn Crimi, uses colorful gouache paintings to portray the gold-infused Venice setting, and a whimsical, cartoon-like style which adds humor to the story. An author's note offers some historical details about the real Nini and his fans. 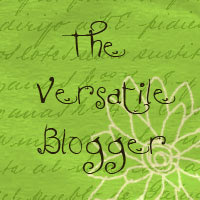 I agree that Mary Nethery has a skill for storytelling involving animals and their importance to our human spirit.